Iran's supreme leader has ordered an end to complaints about the banning of 2,000 reformist candidates from general elections later this month. 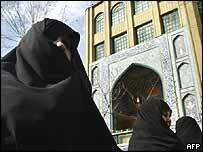 Ayatollah Ali Khamenei dashed any final hopes of a delay to allow a resolution to the country's political crisis. President Mohammad Khatami had argued that the conservative vetting council had been wrong in its blacklist, which includes most well-known reformists. But he conceded defeat and agreed the 20 February vote could go ahead. Mr Khatami and parliamentary speaker Mehdi Karrubi sent a joint letter to Ayatollah Khamenei complaining that the unelected Guardians Council had disregarded the leader's instructions to review the credentials of disqualified candidates, especially among the scores of sitting reformist deputies who have been ruled out. The letter warned that the actions of the council had diminished competition and would lead to reduced public enthusiasm for voting. But in a reply, read on state radio, the supreme leader said the importance of holding elections outweighed other concerns. "For the sake of the election, some complaints from all parties involved need to be ignored and everyone must work hand in hand," he said. The BBC's Jim Muir in Tehran says the reply made it clear that the embattled reformists have a stark choice: to contest the elections with many of their top figures absent, or pull out and leave the way open for a comeback by the conservatives. 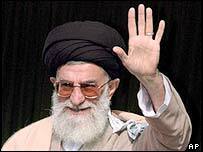 But he adds that there are also questions for Ayatollah Khamenei. "The leader's word is supposed to be final on any issue. His refusal to do more to impose his stated wishes on the hardline council has led many reformists to question where the real power lies," our correspondent says. The crisis began when the decision last month by the unelected Guardians Council to bar nearly half of the 8,200 candidates who wanted to run in the 20 February election. Some were reinstated following rare intervention from Ayatollah Khamenei, who then asked the Council to review the remaining 2,500 cases. But reformist sources say only about 200 more candidates have now been reinstated, leaving more than 2,000 rejected. The biggest of the reform factions, the Participation Front, has declared it will not compete, although some of the other groups have yet to make up their minds. What does the poll result mean beyond Iran's own borders? Why did Iran elect Ahmadinejad?